"A solid operation - awesome software - licensed in New Jersey." 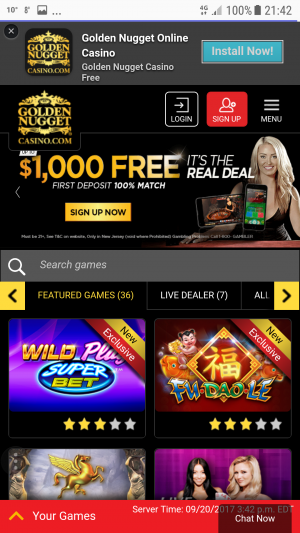 Golden Nugget Casino is the online version of the famous Golden Nugget Casino in Atlantic City, New Jersey. 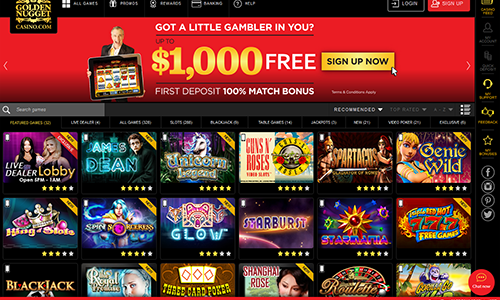 A powerhouse of a casino that has a fantastic line-up of games. Not just the familiar land based casino games like Bally, IGT, and WMS, but NextGen and NetEnt which are exclusively slot games that have been enjoyed by European players for years. It’s great to see them up and running here. They even have live games where you can play against dealers for real – live. 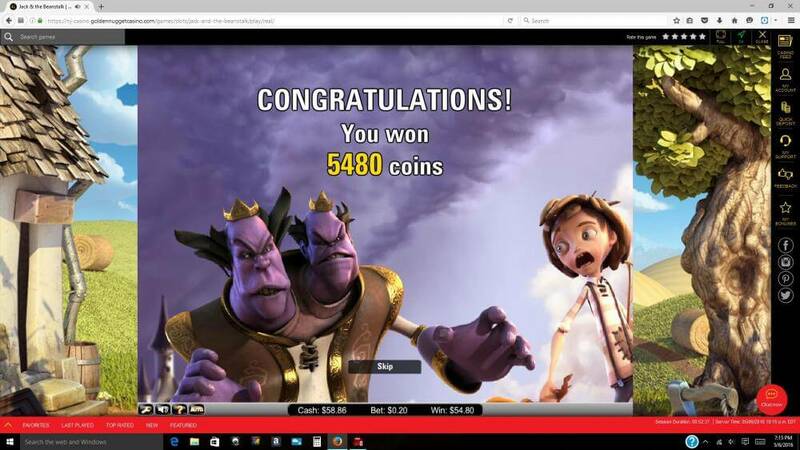 The casino layout is intuitive – it is relatively easy to search for your favorite games – and what is awesome is that for each game, it shows you what the theoretical RTP or return to player percentage is. That is a great move towards transparency. At the land based casino, they won’t tell you what it is – it’s a secret. Depositing is easy, they have a number of payment options to include webwallets like Neteller. Same with withdrawing – you can even withdraw your funds to the land based casino’s cashier to use at the casino or at the hotel bar. That’s brilliant. All in all – a very good casino. Golden Nugget was the last casino to begin operation in the initial surge which brought online gambling to New Jersey. The extra two months they took to ensure their operation was fully ready for public consumption was an early indicator of their dedication to getting it right for their players. Golden Nugget boasts the largest selection of games available to New Jersey online players and their 24/7 customer service is second to none. Their catalog now contains 328 different games including 288 slot titles, 4 live dealer games, 14 table games, 9 blackjack variations, and 21 video pokers and their recent site makeover makes finding all the important features a snap. All the popular banking methods are supported and transferring funds into and out of the casino couldn’t be easier. Notable is the ACH (automated clearing house) check deposit and withdrawal which allows deposits to be available instantly and your withdrawals will be back in your account within 36 hours. *Note that no New Jersey online casino can transfer money into a bank account during the weekends. New players to Golden Nugget are eligible for up to $1000 in bonus funds, and their Golden Rewards Players Club earns you cash back for all your gaming activities. They always have several promotions running for their returning players and while you are playing the “My Account” section will clearly show your progress of any playthrough requirements. This casino is a class operation all the way, exactly what should be expected from one of the most iconic names in the industry. As I mentioned in my video: Their website is very intuitive and it’s easy to search for whatever game you are looking for. 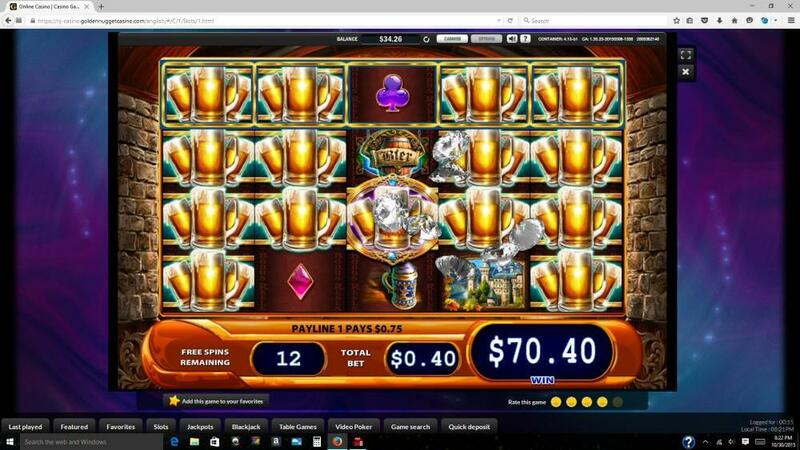 One of the nicest functions of the site is the ability to click the name of a casino game (in the Casino Feed), and viola, there is the RTP – this can give you and idea what you can expect as a theoretical return to player percentage. This is a true advantage over the land based counterpart – since they will never tell you. I’ve asked a floor manager what the RTP was for a certain game, and he said he hadn’t a clue – his supervisors would never tel him. That’s an absolute shame – and a reason to stick with online versions of the games. I am impressed with the overall feel of the site – if I was in New Jersey, I would join up. 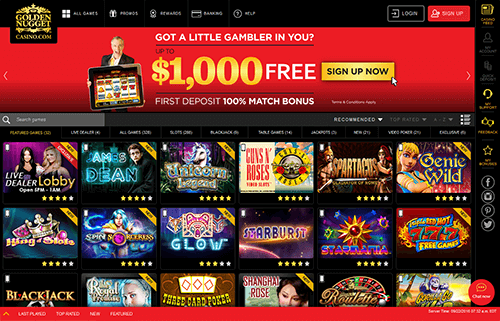 Bonuses: Currently they are offering a 100% Sign up Bonus up to $1000 – minimum deposit of $30! The bonus will expire within 30 days of being credited. Games will contribute differently to the wagering requirements: All Slots 100%, Table Games 20%, Roulette 20%, Blackjack 20% and Video Poker 20%. For example: a $10 bet on any slot game will count as a $10 bet towards meeting the wagering requirements. A $10 bet on any other game will count as a $2 bet towards meeting the wagering requirements. Players will recognize their favorites from the brick and mortar version (IGT and WMS), but I’m sure they will be delighted with the awesomeness of NetEnt and Nextgen. You won’t find these anywhere but online. The primary focus here is slots, so if you are a video slots fan, then your best bet is to go back to the casino. Microgaming has the best Video Poker games, but these are not available to players in the States. That is a downright shame. 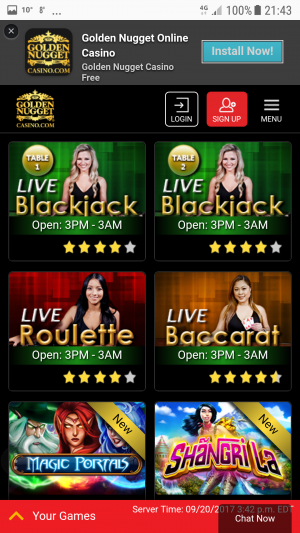 Blackjack, Baccarat, and Roulette are available to play between 5PM and 1AM Eastern Standard Time seven days a week. Smartphone Games Most of these are playable in on your smartphone. But you will find that you are limited to 135 games to play instead of the full portfolio of 329 games. These games include the Live Dealers by the way. Golden Nugget casino is a very strong brand, and New Jersey residents are lucky to be able to play there. One of the only drawbacks is that if you are a video poker fan (like me), you’d be better off in the real actual casino, or drive to Canada and play at a Microgaming online casino. 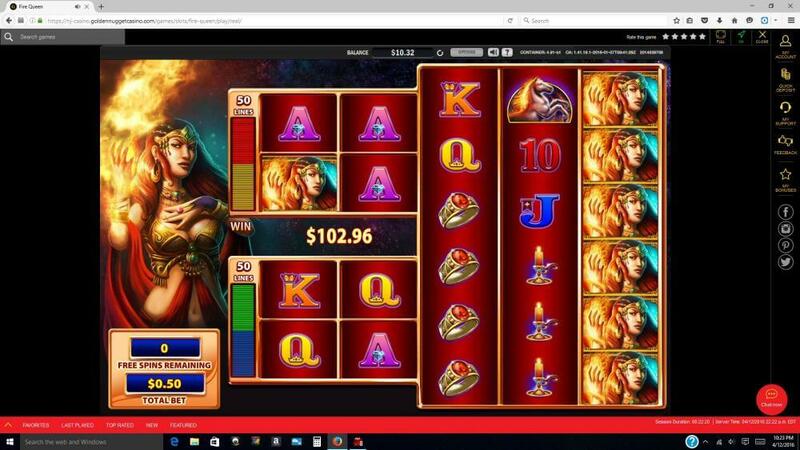 But if it’s slots you are looking for – you have come to the right place.